Kendall Toyota used car center is pleased to offer Your buying risks are reduced thanks to a CARFAX BuyBack Guarantee. Simply put, this Four Wheel Drive is engineered with higher standards. Enjoy improved steering, superior acceleration, and increased stability and safety while driving this 4WD Toyota Tacoma TRD Sport. Based on the superb condition of this vehicle, along with the options and color, this Toyota Tacoma TRD Sport is sure to sell fast. More information about the 2016 Toyota Tacoma: The Tacoma starts at just above $23,000, and competes with other compact pickup trucks like the Chevrolet Colorado and the Nissan Frontier. However, neither of these competitors has Toyota's reputation for quality, safety and longevity. Unlike full-sized trucks, the Tacoma is small enough to make sense in both urban and suburban environments. The Tacoma can maneuver nimbly in tight parking lots, and its turning radius is kept reasonable. At the same time, the Tacoma offers the kind of utility that compact SUVs can only dream of. With a broad range of customization options, the Tacoma offers a surprisingly amount of comfort, and even gives owners the kind of interior space normally found in sedans. The Tacoma is truly a 'do-everything' vehicle. Strengths of this model include low base price, legendary reliability, high resale value, eminently capable, and Roomy cabin Located next to the foot bridge on Good Pasture Island Road, come see us at Kendall Toyota Used Car Center. Kendall Toyota used car center is pleased to offer This 2014 Toyota Tacoma comes with a CARFAX Buyback Guarantee, which means you can buy with certainty. You've found the one you've been looking for. Your dream car. Just what you've been looking for. With quality in mind, this vehicle is the perfect addition to take home. More information about the 2014 Toyota Tacoma: Spanning the range from basic work truck to well-equipped off-road or sport truck, the Toyota Tacoma gives truck enthusiasts what they need or want, without having to get a full-size pickup. Compared to full-size trucks, the Tacoma is more maneuverable and especially in Regular Cab versions it can be parked in places a full-size truck never could. With the 4-cylinder engine, the Tacoma is one of the most fuel-efficient pickups available. Pre-Runner or rugged off-road (TX Pro) forms, it's a good-looking sport truck serving a specialized task. While the interiors of Tacoma models are not particularly luxurious, Toyota has equipped truck with the latest in sound systems and infotainment. This model sets itself apart with simple, straightforward interior, parking ease and maneuverability, wide range of models, affordability, and Gas mileage with 4-cylinder engine Located next to the foot bridge on Good Pasture Island Road, come see us at Kendall Toyota Used Car Center. Kendall Toyota used car center is pleased to offer Drive home in your new pre-owned vehicle with the knowledge you're fully backed by the CARFAX Buyback Guarantee. This vehicle comes with 4WD for better traction on unstable surfaces, like snow and dirt to give you the edge over anything you might encounter on the road. The Toyota Tundra 4WD Truck SR5 will provide you with everything you have always wanted in a car -- Quality, Reliability, and Character. More information about the 2014 Toyota Tundra 4WD Truck: The 2014 Tundra CrewMax has best-in-class legroom according to Toyota and offers the only reclining and sliding rear seat among pickups. The Tundra also offers one of the best-designed interiors, with plenty of storage space and easy access to the backseat area. The available 5.7L engine makes 381 horsepower and 401 lb-feet of torque, with hauling and towing ability near the top of the segment. This model sets itself apart with pair of V8 engine options, thoughtful interior design, towing and hauling ability, and Safety features Located next to the foot bridge on Good Pasture Island Road, come see us at Kendall Toyota Used Car Center. Kendall Toyota used car center is pleased to offer Drive home in your new pre-owned vehicle with the knowledge you're fully backed by the CARFAX Buyback Guarantee. This 4WD-equipped vehicle will handle beautifully on any terrain and in any weather condition your may find yourself in. The benefits of driving a 4 wheel drive vehicle, such as this Toyota Tacoma , include superior acceleration, improved steering, and increased traction and stability. Exceptional in every sense of the word, this incredibly low mileage vehicle is one of a kind. 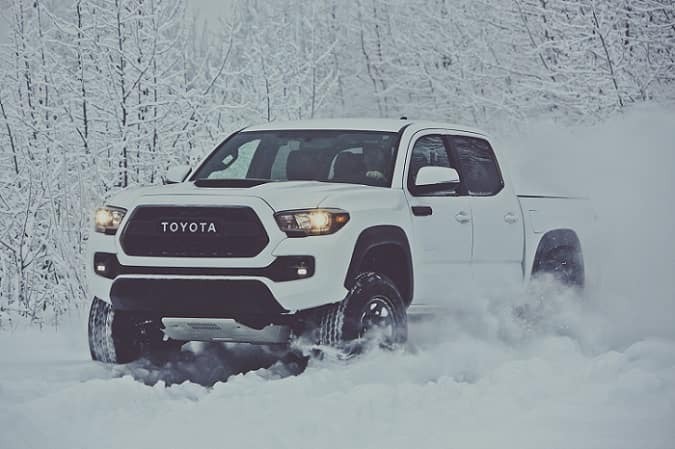 More information about the 2015 Toyota Tacoma: Spanning the range from basic work truck to well-equipped off-road or sport truck, the Toyota Tacoma gives truck enthusiasts what they need or want, without having to get a full-size pickup. Compared to full-size trucks, the Tacoma is more maneuverable and can be parked in places a full-size truck never could. With the 4-cylinder engine, the Tacoma is one of the most fuel-efficient pickups available. In Pre-Runner or rugged off-road forms, it's a good-looking sport truck serving a specialized task. While the interiors of Tacoma models are not particularly luxurious, Toyota has equipped the trucks with the latest in sound systems and infotainment. Strengths of this model include wide range of models, Gas mileage with 4-cylinder engine, affordability, and parking ease and maneuverability Located next to the foot bridge on Good Pasture Island Road, come see us at Kendall Toyota Used Car Center. Kendall Toyota used car center is pleased to offer CARFAX BuyBack Guarantee is reassurance that any major issues with this vehicle will show on CARFAX report. When Toyota created this vehicle with 4 wheel drive, they immediately enhanced the performance ability. Easily switch between two and four wheel drive to take advantage of the improved steering and superior acceleration. This vehicle won't last long, take it home today. More information about the 2016 Toyota Tundra 4WD Truck: The 2016 Tundra CrewMax has best-in-class legroom according to Toyota and offers the only reclining and sliding rear seat among pickups. The Tundra also offers one of the best-designed interiors, with plenty of storage space and easy access to the backseat area. The available 5.7L engine makes 381 horsepower and 401 foot-pounds of torque, with hauling and towing ability near the top of the segment. Strengths of this model include pair of V8 engine options, towing and hauling ability, thoughtful interior design, and Safety features Located next to the foot bridge on Good Pasture Island Road, come see us at Kendall Toyota Used Car Center. Kendall Toyota used car center is pleased to offer Your buying risks are reduced thanks to a CARFAX BuyBack Guarantee. Equipped with 4WD, this Toyota Tacoma gives you added confidence to tackle the surface of any path you take. The Toyota Tacoma TRD Off Road will provide you with everything you have always wanted in a car -- Quality, Reliability, and Character. More information about the 2016 Toyota Tacoma: The Tacoma starts at just above $23,000, and competes with other compact pickup trucks like the Chevrolet Colorado and the Nissan Frontier. However, neither of these competitors has Toyota's reputation for quality, safety and longevity. Unlike full-sized trucks, the Tacoma is small enough to make sense in both urban and suburban environments. The Tacoma can maneuver nimbly in tight parking lots, and its turning radius is kept reasonable. At the same time, the Tacoma offers the kind of utility that compact SUVs can only dream of. With a broad range of customization options, the Tacoma offers a surprisingly amount of comfort, and even gives owners the kind of interior space normally found in sedans. The Tacoma is truly a 'do-everything' vehicle. Strengths of this model include low base price, legendary reliability, high resale value, eminently capable, and Roomy cabin Located next to the foot bridge on Good Pasture Island Road, come see us at Kendall Toyota Used Car Center. Kendall Toyota used car center is pleased to offer When you purchase a vehicle with the CARFAX Buyback Guarantee, you're getting what you paid for. At home in the country and in the city, this 2015 4WD Toyota Tacoma has been wonderfully refined to handle any occasion. Smooth steering, superior acceleration and a supple ride are just a few of its qualities. You can tell this 2015 Toyota Tacoma has been pampered by the fact that it has less than 32,610mi and appears with a showroom shine. More information about the 2015 Toyota Tacoma: Spanning the range from basic work truck to well-equipped off-road or sport truck, the Toyota Tacoma gives truck enthusiasts what they need or want, without having to get a full-size pickup. Compared to full-size trucks, the Tacoma is more maneuverable and can be parked in places a full-size truck never could. With the 4-cylinder engine, the Tacoma is one of the most fuel-efficient pickups available. In Pre-Runner or rugged off-road forms, it's a good-looking sport truck serving a specialized task. While the interiors of Tacoma models are not particularly luxurious, Toyota has equipped the trucks with the latest in sound systems and infotainment. Interesting features of this model are wide range of models, Gas mileage with 4-cylinder engine, affordability, and parking ease and maneuverability Located next to the foot bridge on Good Pasture Island Road, come see us at Kendall Toyota Used Car Center. Kendall Toyota used car center is pleased to offer When you purchase a vehicle with the CARFAX Buyback Guarantee, you're getting what you paid for. Equipped with 4WD, this Toyota Tacoma gives you added confidence to tackle the surface of any path you take. The Toyota Tacoma SR5 will provide you with everything you have always wanted in a car -- Quality, Reliability, and Character. Just what you've been looking for. With quality in mind, this vehicle is the perfect addition to take home. Located next to the foot bridge on Good Pasture Island Road, come see us at Kendall Toyota Used Car Center. Kendall Toyota used car center is pleased to offer When you purchase a vehicle with the CARFAX Buyback Guarantee, you're getting what you paid for. This vehicle comes with 4WD for better traction on unstable surfaces, like snow and dirt to give you the edge over anything you might encounter on the road. You could keep looking, but why? You've found the perfect vehicle right here. The Tacoma competes with other compact pickup trucks such as the Chevrolet Colorado and the Nissan Frontier. However, neither of these competitors has the reputation of Toyota. Unlike full-sized trucks, the Tacoma is small enough to make sense in both urban and suburban environments. The Tacoma can maneuver nimbly in tight parking lots, and its turning radius is kept reasonable. At the same time, the Toyota offers the kind of utility that compact SUVs can only dream of. With a broad range of customization options, the Tacoma offers a surprisingly amount of comfort, and even gives owners the kind of interior space normally found in sedans. The Tacoma is truly a do-everything vehicle. Located next to the foot bridge on Good Pasture Island Road, come see us at Kendall Toyota Used Car Center. Kendall Toyota used car center is pleased to offer When you purchase a vehicle with the CARFAX Buyback Guarantee, you're getting what you paid for. This vehicle has passed our highest inspection standards and is therefore awarded a Certified status. When Toyota created this vehicle with 4 wheel drive, they immediately enhanced the performance ability. Easily switch between two and four wheel drive to take advantage of the improved steering and superior acceleration. The Tacoma competes with other compact pickup trucks such as the Chevrolet Colorado and the Nissan Frontier. However, neither of these competitors has the reputation of Toyota. Unlike full-sized trucks, the Tacoma is small enough to make sense in both urban and suburban environments. The Tacoma can maneuver nimbly in tight parking lots, and its turning radius is kept reasonable. At the same time, the Toyota offers the kind of utility that compact SUVs can only dream of. With a broad range of customization options, the Tacoma offers a surprisingly amount of comfort, and even gives owners the kind of interior space normally found in sedans. The Tacoma is truly a do-everything vehicle. Located next to the foot bridge on Good Pasture Island Road, come see us at Kendall Toyota Used Car Center. Kendall Toyota used car center is pleased to offer Drive home in your new pre-owned vehicle with the knowledge you're fully backed by the CARFAX Buyback Guarantee. Handle any terrain with ease thanks to this grippy 4WD. Whether you're on a slick pavement or exploring the back country, you'll be able to do it with confidence. There is no reason why you shouldn't buy this Toyota Tacoma SR5. It is incomparable for the price and quality. The quintessential Toyota -- This Toyota Tacoma SR5 speaks volumes about its owner, about uncompromising individuality, a passion for driving and standards far above the ordinary. Located next to the foot bridge on Good Pasture Island Road, come see us at Kendall Toyota Used Car Center. Kendall Toyota used car center is pleased to offer At home in the country and in the city, this 2017 4WD Toyota Tundra 4WD SR5 has been wonderfully refined to handle any occasion. Smooth steering, superior acceleration and a supple ride are just a few of its qualities. You could keep looking, but why? You've found the perfect vehicle right here. This is about the time when you're saying it is too good to be true, and let us be the one's to tell you, it is absolutely true. This is the one. Just what you've been looking for. Located next to the foot bridge on Good Pasture Island Road, come see us at Kendall Toyota Used Car Center. Kendall Toyota used car center is pleased to offer This 2016 Toyota Tacoma comes with a CARFAX Buyback Guarantee, which means you can buy with certainty. Taking the road less traveled has never been more fun than with this 4WD. With improved performance, mileage and acceleration, this 2016 4WD Toyota Tacoma TRD Sport is king of the off-road. Driven by many, but adored by more, the Toyota Tacoma TRD Sport is a perfect addition to any home. More information about the 2016 Toyota Tacoma: The Tacoma starts at just above $23,000, and competes with other compact pickup trucks like the Chevrolet Colorado and the Nissan Frontier. However, neither of these competitors has Toyota's reputation for quality, safety and longevity. Unlike full-sized trucks, the Tacoma is small enough to make sense in both urban and suburban environments. The Tacoma can maneuver nimbly in tight parking lots, and its turning radius is kept reasonable. At the same time, the Tacoma offers the kind of utility that compact SUVs can only dream of. With a broad range of customization options, the Tacoma offers a surprisingly amount of comfort, and even gives owners the kind of interior space normally found in sedans. The Tacoma is truly a 'do-everything' vehicle. This model sets itself apart with low base price, legendary reliability, high resale value, eminently capable, and Roomy cabin Located next to the foot bridge on Good Pasture Island Road, come see us at Kendall Toyota Used Car Center. Kendall Toyota used car center is pleased to offer CARFAX BuyBack Guarantee is reassurance that any major issues with this vehicle will show on CARFAX report. This is a Certified Pre-owned vehicle, so you can feel rest assured that it has been meticulously inspected from top to bottom. Is it possible to fall in love with a vehicle? It is when your vehicle is as prestige as the Toyota Tundra 4WD Truck. This 4WD-equipped vehicle will handle beautifully on any terrain and in any weather condition your may find yourself in. The benefits of driving a 4 wheel drive vehicle, such as this Toyota Tundra 4WD Truck LTD, include superior acceleration, improved steering, and increased traction and stability. One of the best things about this Toyota Tundra 4WD Truck is that it has low, low mileage. It's ready for you to truly break it in. More information about the 2016 Toyota Tundra 4WD Truck: The 2016 Tundra CrewMax has best-in-class legroom according to Toyota and offers the only reclining and sliding rear seat among pickups. The Tundra also offers one of the best-designed interiors, with plenty of storage space and easy access to the backseat area. The available 5.7L engine makes 381 horsepower and 401 foot-pounds of torque, with hauling and towing ability near the top of the segment. Strengths of this model include pair of V8 engine options, towing and hauling ability, thoughtful interior design, and Safety features Located next to the foot bridge on Good Pasture Island Road, come see us at Kendall Toyota Used Car Center. Kendall Toyota used car center is pleased to offer When you purchase a vehicle with the CARFAX Buyback Guarantee, you're getting what you paid for. When Toyota created this vehicle with 4 wheel drive, they immediately enhanced the performance ability. Easily switch between two and four wheel drive to take advantage of the improved steering and superior acceleration. The incredibly low mileage and painstaking upkeep on this Toyota Tacoma makes it a once-in-a-lifetime deal that won't last long! Call us today to reserve your test drive! The Tacoma competes with other compact pickup trucks such as the Chevrolet Colorado and the Nissan Frontier. However, neither of these competitors has the reputation of Toyota. Unlike full-sized trucks, the Tacoma is small enough to make sense in both urban and suburban environments. The Tacoma can maneuver nimbly in tight parking lots, and its turning radius is kept reasonable. At the same time, the Toyota offers the kind of utility that compact SUVs can only dream of. With a broad range of customization options, the Tacoma offers a surprisingly amount of comfort, and even gives owners the kind of interior space normally found in sedans. The Tacoma is truly a do-everything vehicle. Located next to the foot bridge on Good Pasture Island Road, come see us at Kendall Toyota Used Car Center. Are you looking for something to pull that new fishing boat, horse trailer, or trailer loaded with ATVs, but a new Toyota truck just doesn’t quite fit in the budget? Shop our inventory of used trucks at Kendall Toyota of Eugene. Our used truck dealership has a massive selection of used trucks for sale in Eugene and we’re sure to have a used pickup truck that fits your needs and budget. Contact us online or visit us at 373 Goodpasture Island Rd. Eugene, Oregon 97401 to shop our selection of used trucks. We also serve the Florence, Cottage Grove, and Lebanon areas. When you shop our catalog of used trucks for sale in Eugene, we’re sure you’ll find the style and size of truck that you’re looking for. From heavy duty trucks down to midsize trucks, we offer trucks from a variety of automakers that include diesel and 4×4 off-road trucks. You’ll love our selection of used Toyota trucks equipped with Toyota TRD packages. After you browse our inventory of used trucks, be sure to visit our Toyota Finance Center. You can save time before you get here and start on the financing process by filling out our online finance application. Our financial experts can also help you get pre-approved for a Eugene auto loan and calculate the trade-in value of your current vehicle. No matter what kind of used truck you’re searching for, Kendall Toyota of Eugene is the used truck dealer that has something to fit your budget. Come by and let us help you find the used truck you’re looking for today.